Nicotine, one of more than 4,000 chemicals found in the smoke from tobacco products such as cigarettes, cigars, and pipes, is the primary component in tobacco that acts on the brain. Smokeless tobacco products such as snuff and chewing tobacco also contain many toxins as well as high levels of nicotine. 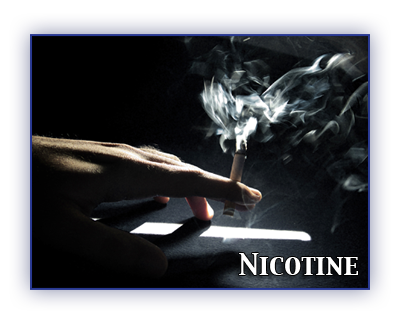 Nicotine, recognized as one of the most frequently used addictive drugs, is a naturally occurring colorless liquid that turns brown when burned and acquires the odor of tobacco when exposed to air. There are many species of tobacco plants; the tabacum species serves as the major source of tobacco products today. Since nicotine was first identified in the early 1800s, it has been studied extensively and shown to have a number of complex and sometimes unpredictable effects on the brain and the body. Cigarette smoking is the most prevalent form of nicotine addiction in the United States. Most cigarettes in the U.S. market today contain 10 milligrams (mg) or more of nicotine. Through inhaling smoke, the average smoker takes in 1 to 2 mg nicotine per cigarette. There have been substantial increases in the sale and consumption of smokeless tobacco products also, and more recently, in cigar sales. Nicotine is absorbed through the skin and mucosal lining of the mouth and nose or by inhalation in the lungs. Depending on how tobacco is taken, nicotine can reach peak levels in the bloodstream and brain rapidly. Cigarette smoking, for example, results in rapid distribution of nicotine throughout the body, reaching the brain within 10 seconds of inhalation. Cigar and pipe smokers, on the other hand, typically do not inhale the smoke, so nicotine is absorbed more slowly through the mucosal membranes of their mouths. Nicotine from smokeless tobacco also is absorbed through the mucosal membranes. Yes, nicotine is addictive. Most smokers use tobacco regularly because they are addicted to nicotine. Addiction is characterized by compulsive drug-seeking and use, even in the face of negative health consequences, and tobacco use certainly fits the description. It is well documented that most smokers identify tobacco as harmful and express a desire to reduce or stop using it, and nearly 35 million of them make a serious attempt to quit each year. Unfortunately, less than 7 percent of those who try to quit on their own achieve more than 1 year of abstinence; most relapse within a few days of attempting to quit. Other factors to consider besides nicotine’s addictive properties include its high level of availability, the small number of legal and social consequences of tobacco use, and the sophisticated marketing and advertising methods used by tobacco companies. These factors, combined with nicotine’s addictive properties, often serve as determinants for first use and, ultimately, addiction. Recent research has shown in fine detail how nicotine acts on the brain to produce a number of behavioral effects. Of primary importance to its addictive nature are findings that nicotine activates the brain circuitry that regulates feelings of pleasure, the so-called reward pathways. A key brain chemical involved in mediating the desire to consume drugs is the neurotransmitter dopamine, and research has shown that nicotine increases the levels of dopamine in the reward circuits. Nicotine’s pharmacokinetic properties have been found also to enhance its abuse potential. Cigarette smoking produces a rapid distribution of nicotine to the brain, with drug levels peaking within 10 seconds of inhalation. The acute effects of nicotine dissipate in a few minutes, causing the smoker to continue dosing frequently throughout the day to maintain the drug’s pleasurable effects and prevent withdrawal. What people frequently do not realize is that the cigarette is a very efficient and highly engineered drug-delivery system. By inhaling, the smoker can get nicotine to the brain very rapidly with every puff. A typical smoker will take 10 puffs on a cigarette over a period of 5 minutes that the cigarette is lit. Thus, a person who smokes about 1-1/2 packs (30 cigarettes) daily, gets 300 “hits” of nicotine to the brain each day. These factors contribute considerably to nicotine’s highly addictive nature. Scientific research is also beginning to show that nicotine may not be the only psychoactive ingredient in tobacco. Using advanced neuroimaging technology, scientists can see the dramatic effect of cigarette smoking on the brain and are finding a marked decrease in the levels of monoamineoxidase (MAO), an important enzyme that is responsible for breaking down dopamine. The change in MAO must be caused by some tobacco smoke ingredient other than nicotine, since we know that nicotine itself does not dramatically alter MAO levels. The decrease in two forms of MAO, A and B, then results in higher dopamine levels and may be another reason that smokers continue to smoke – to sustain the high dopamine levels that result in the desire for repeated drug use. What is the extent and impact of tobacco use? According to the 1996 National Household Survey on Drug Abuse, an estimated 62 million Americans were current smokers in 1996, and another 6.8 million used smokeless tobacco, which means that nicotine is one of the most widely abused substances. In addition, it is estimated that each day in the United States, nearly 3,000 people under the age of 18 will start smoking. According to the Centers for Disease Control and Prevention (CDC), the prevalence of cigarette smoking among U.S. high school students increased from 27.5 percent in 1991 to 36.4 percent in 1997. NIDA’s own Monitoring the Future Study, which annually surveys drug use and related attitudes of America’s adolescents, also found the prevalence rates for smoking among youth remained high. Since 1975, nicotine in the form of cigarettes has consistently been the substance the greatest number of high school students use daily. The impact of nicotine addiction in terms of morbidity, mortality, and economic costs to society is staggering. Tobacco kills more than 430,000 U.S. citizens each year – more than alcohol, cocaine, heroin, homicide, suicide, car accidents, fire, and AIDS combined. Tobacco use is the leading preventable cause of death in the United States. Economically, smoking is responsible for approximately 7 percent of total U.S. health care costs, an estimated $50 billion each year. However, this cost is well below the total cost to society because it does not include burn care from smoking-related fires, perinatal care for low-birth-weight infants of mothers who smoke, and medical care costs associated with disease caused by secondhand smoke. Taken together, the direct and indirect costs of smoking are estimated at more than $100 billion per year. How does Nicotine deliver its effect? Nicotine can act as both a stimulant and a sedative. Immediately after exposure to nicotine, there is a “kick” caused in part by the drug’s stimulation of the adrenal glands and resulting discharge of epinephrine (adrenaline). The rush of adrenaline stimulates the body and causes a sudden release of glucose as well as an increase in blood pressure, respiration, and heart rate. Nicotine also suppresses insulin output from the pancreas, which means that smokers are always slightly hyperglycemic. In addition, nicotine indirectly causes a release of dopamine in the brain regions that control pleasure and motivation. This reaction is similar to that seen with other drugs of abuse – such as cocaine and heroin – and it is thought to underlie the pleasurable sensations experienced by many smokers. In contrast, nicotine can also exert a sedative effect, depending on the level of the smoker’s nervous system arousal and the dose of nicotine taken. What happens when Nicotine is taken for long periods of time? Chronic exposure to nicotine results in addiction. Research is just beginning to document all of the neurological changes that accompany the development and maintenance of nicotine addiction. The behavioral consequences of these changes are well documented, however. Greater than 90 percent of those smokers who try to quit without seeking treatment fail, with most relapsing within a week. Repeated exposure to nicotine results in the development of tolerance, the condition in which higher doses of a drug are required to produce the same initial stimulation. Nicotine is metabolized fairly rapidly, disappearing from the body in a few hours. Therefore some tolerance is lost overnight, and smokers often report that the first cigarettes of the day are the strongest and/or the “best.” As the day progresses, acute tolerance develops, and later cigarettes have less effect. Cessation of nicotine use is followed by a withdrawal syndrome that may last a month or more; it includes symptoms that can quickly drive people back to tobacco use. Nicotine withdrawal symptoms include irritability, craving, cognitive and attentional deficits, sleep disturbances, and increased appetite and may begin within a few hours after the last cigarette. Symptoms peak within the first few days and may subside within a few weeks. For some people, however, symptoms may persist for months or longer. An important but poorly understood component of the nicotine withdrawal syndrome is craving, an urge for nicotine that has been described as a major obstacle to successful abstinence. High levels of craving for tobacco may persist for 6 months or longer. While the withdrawal syndrome is related to the pharmacological effects of nicotine, many behavioral factors also can affect the severity of withdrawal symptoms. For some people, the feel, smell, and sight of a cigarette and the ritual of obtaining, handling, lighting, and smoking the cigarette are all associated with the pleasurable effects of smoking and can make withdrawal or craving worse. While nicotine gum and patches may alleviate the pharmacological aspects of withdrawal, cravings often persist. What are the medical consequences of Nicotine use? The medical consequences of nicotine exposure result from effects of both the nicotine itself and how it is taken. The most deleterious effects of nicotine addiction are the result of tobacco use, which accounts for one-third of all cancers. Foremost among the cancers caused by tobacco is lung cancer – the number one cancer killer of both men and women. Cigarette smoking has been linked to about 90 percent of all lung cancer cases. In addition to lung cancer, smoking also causes lung diseases such as chronic bronchitis and emphysema, and it has been found to exacerbate asthma symptoms in adults and children. Smoking is also associated with cancers of the mouth, pharynx, larynx, esophagus, stomach, pancreas, cervix, kidney, ureter, and bladder. The overall rates of death from cancer are twice as high among smokers as among nonsmokers, with heavy smokers having rates that are four times greater than those of nonsmokers. Cigarette smoking is the most important preventable cause of cancer in the United States. In addition to its ability to cause cancer, a relationship between cigarette smoking and coronary heart disease was first reported in the 1940s. Since that time, it has been well documented that smoking substantially increases the risk of heart disease, including stroke, heart attack, vascular disease, and aneurysm. It is estimated that nearly one-fifth of deaths from heart disease are attributable to smoking. While we often think of medical consequences that result from direct use of tobacco products, passive or secondary smoke also increases the risk for many diseases. Environmental tobacco smoke (ETS) is a major source of indoor air contaminants; secondhand smoke is estimated to cause approximately 3,000 lung cancer deaths per year among nonsmokers and contributes to as many as 40,000 deaths related to cardiovascular disease. Exposure to tobacco smoke in the home increases the severity of asthma for children and is a risk factor for new cases of childhood asthma. ETS exposure has been linked also with sudden infant death syndrome. Additionally, dropped cigarettes are the leading cause of residential fire fatalities, leading to more than 1,000 such deaths each year. At higher doses, such as the nicotine that can be found in some insecticide sprays, nicotine can be extremely toxic, causing vomiting, tremors, convulsions, and death. Nicotine poisoning has been reported from accidental ingestion of insecticides by adults and ingestion of tobacco products by children and pets. Death usually results in a few minutes from respiratory failure caused by paralysis. Laboratory research indicates that cigarette smoking causes toxic cardiovascular effects. For this reason, nicotine replacement medicines such as nicotine gum and the patch have been extensively evaluated for cardiovascular toxicity, especially for patients with cardiac disease. These trials suggest that use of nicotine replacements for smoking cessation does not increase cardiovascular risk. These findings are consistent with the generally slower and lower doses of nicotine obtained from the medicines as compared to tobacco products, and to the absence of carbon monoxide and numerous other toxins in tobacco smoke. Smoking and Pregnancy: What are the risks? In pregnant women, carbon monoxide (a lethal gas) and the high doses of nicotine obtained when they inhale tobacco smoke interferes with oxygen supply to the fetus. Nicotine readily crosses the placenta, and nicotine concentrations in the fetus can be as much as 15 percent higher than maternal levels. It appears that nicotine is concentrated in fetal blood, amniotic fluid, and breast milk. Another ingredient of tobacco smoke, carbon monoxide, has been shown to inhibit the release of oxygen into fetal tissues. These factors, combined, likely account for the developmental delays commonly seen in the fetuses and infants of smoking mothers. Women who smoke during pregnancy are at greater risk than nonsmokers for premature delivery, and there is a risk of lower birth weight for infants carried to term. In the United States it is estimated that 20 percent or more of pregnant women smoke throughout their pregnancies. The adverse effects of smoking may occur in every trimester of pregnancy; they range from spontaneous abortions in the first trimester to increased premature delivery rates and decreased birth weights in the final trimester. The decreased birth weights seen in infants of mothers who smoke reflects a dose-dependent relationship: the more the woman smokes during pregnancy, the greater the reduction of infant birth weight. Conversely, women who give up smoking early in pregnancy have infants of similar weight to those of nonsmokers. Are there effective treatments for Nicotine addiction? Yes, extensive research has shown that behavioral and pharmacological treatments for nicotine addiction do work. For those individuals motivated to quit smoking, a combination of behavioral and pharmacological treatments can increase the success rate approximately twofold over placebo treatments. Furthermore, smoking cessation can have an immediate positive impact on an individual’s health; for example, a 35-year-old man who quits smoking will, on the average, increase his life expectancy by 5.1 years. Nicotine was the first pharmacological agent approved by the Food and Drug Administration (FDA) for use in smoking cessation therapy. Nicotine replacement therapies, such as nicotine gum, the transdermal patch, nasal spray, and inhaler, have been approved for use in the United States. They are all used to relieve withdrawal symptoms, produce less severe physiological alterations than tobacco-based systems, and generally provide users with lower overall nicotine levels than they receive with tobacco. An added benefit is that these forms of nicotine have little abuse potential since they do not produce the pleasurable effects of tobacco products. Nor do they contain the carcinogens and gases associated with tobacco smoke. The FDA’s approval of nicotine gum in 1984 marked the availability (by prescription) of the first nicotine replacement therapy on the U.S. market. In 1996, the FDA approved gum (Nicorette”) for over-the-counter sales. Whereas nicotine gum provides some smokers with their desired control over dose and ability to relieve cravings, others are unable to tolerate the taste and chewing demands. In 1991-1992, FDA approved four transdermal nicotine patches, two of which became over-the-counter products in 1996, thus meeting the needs of many additional tobacco users. Since the introduction of nicotine gum and the transdermal patch, estimates based on FDA and pharmaceutical industry data indicate that more than 1 million individuals have been successfully treated for nicotine addiction. In 1996 a nicotine nasal spray, and in 1998 a nicotine inhaler, became available by prescription. All the nicotine replacement products – gum, patch, spray and inhaler – appear to be equally effective. In fact, the over-the-counter availability of many of these medications, combined with increased messages to quit smoking in the media, has produced about a 20 percent increase in successful quitting each year. Although the major focus of pharmacological treatments of nicotine addiction has been nicotine replacement, other treatments are being developed for relief of nicotine withdrawal symptoms. For example, the first non-nicotine prescription drug, bupropion, an antidepressant marketed as Zyban”, has been approved for use as a pharmacological treatment for nicotine addiction. In December 1996, a Federal advisory committee recommended that the FDA approve bupropion to become the first drug to help people quit smoking that could be taken in pill form, and the first to contain no nicotine. Behavioral interventions can play an integral role in nicotine addiction treatment. Over the past decade, this approach has spread from primarily clinic-based, formal smoking-cessation programs to application in numerous community and public health settings, and now by telephone and written formats as well. In general, behavioral methods are employed to (a) discover high-risk relapse situations, (b) create an aversion to smoking, (c) develop self-monitoring of smoking behavior, and (d) establish competing coping responses. Other key factors in successful treatment include avoiding smokers and smoking environments and receiving support from family and friends. The single most important factor, however, may be the learning and use of coping skills for both short- and long-term prevention of relapse. Smokers must not only learn behavioral and cognitive tools for relapse prevention but must also be ready to apply those skills in a crisis. Although behavioral and pharmacological treatments can be extremely successful when employed alone, science has taught us that integrating both types of treatments will ultimately be the most effective approach. More than 90 percent of the people who try to quit smoking relapse or return to smoking within 1 year, with the majority relapsing within a week. There are, however, an estimated 2.5 to 5 percent who do in fact succeed on their own. It has been shown that pharmacological treatments can double the odds of their success. However, a combination of pharmacological and behavioral treatments further improves their chances. For example, when use of the nicotine patch is combined with a behavioral approach, such as group therapy or social support networks, the efficacy of treatment is significantly enhanced. Several avenues of research now indicate that men and women differ in their smoking behavior and that differences in nicotine sensitivity may be the root cause. Studies of smoking behavior seem to indicate that women smoke fewer cigarettes per day, tend to use cigarettes with lower nicotine content, and do not inhale as deeply as men. Whether this is because of differences in sensitivity to nicotine is an important research question. Some researchers are finding that women may be more affected by factors other than nicotine, such as the sensory aspects of the smoke or social factors, than they are by nicotine itself. The number of smokers in the United States declined in the 1970s and 1980s, but has been relatively stable throughout the 1990s. Because this decline of smoking was greater among men than women, the prevalence of smoking is only slightly higher for men today than it is for women, and might actually be greater in women by 2000. Several factors appear to be contributing to this trend, including increased initiation of smoking among female teens and, more critically, women being less likely than men to quit smoking. Large-scale smoking-cessation trials show that women are less likely to initiate quitting and may be more likely to relapse if they do quit. In cessation programs using nicotine replacement methods, such as the patch or gum, the nicotine does not seem to reduce craving as effectively for women as for men. Other factors that may contribute to women’s difficulty with quitting are that the withdrawal syndrome may be more intense for women and that they appear more likely than men to gain weight upon quitting. It is important for women entering smoking cessation programs to be aware that standard treatment regimens may have to be adjusted to compensate for gender differences in nicotine sensitivity.